Anastasia Beverly Hills has a new gift set out for spring. It's a light, beachy-themed color palette and it's really quite nice. The set is called Wish You Were Here and it contains three full sized Anastasia products. 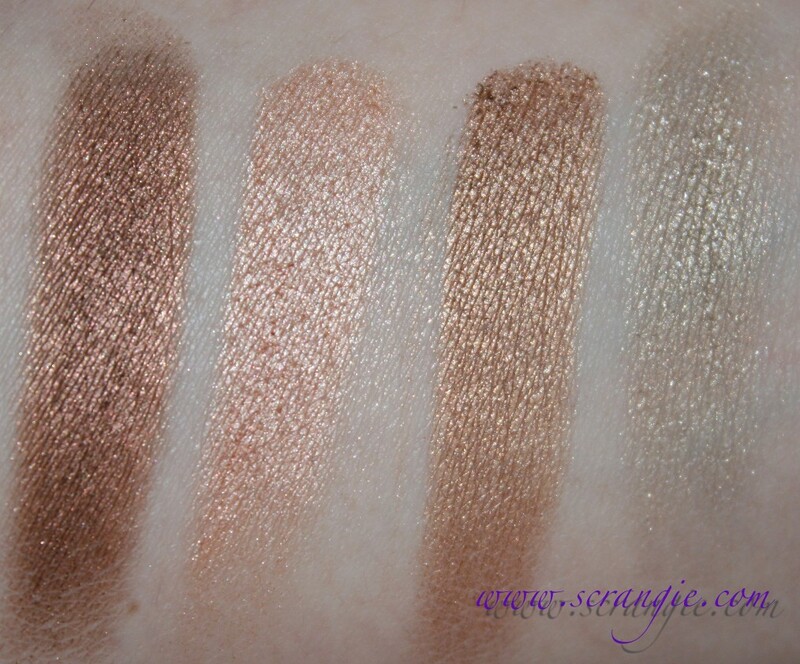 The Illumin8 shadow palette in this set is one of the eight shade ones. This one's called Pacific Coast. 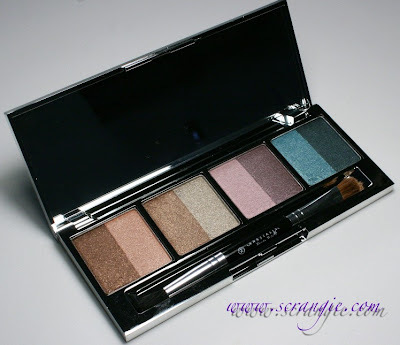 Anastasia Illumin8 Eyeshadow Palette in Pacific Coast. Fluorescent light, flash and natural light. Click them if you'd like to see a closeup of the shadows. None of the shadows have names, but they are numbered on the back of the palette. 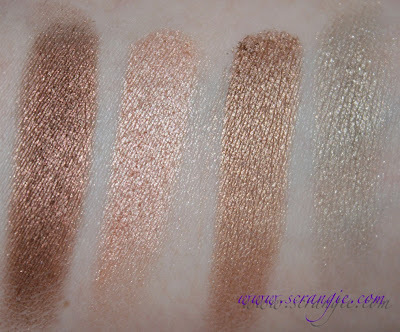 Swatched over bare skin (no primer), with flash and without. 1, 2, 3, 4. 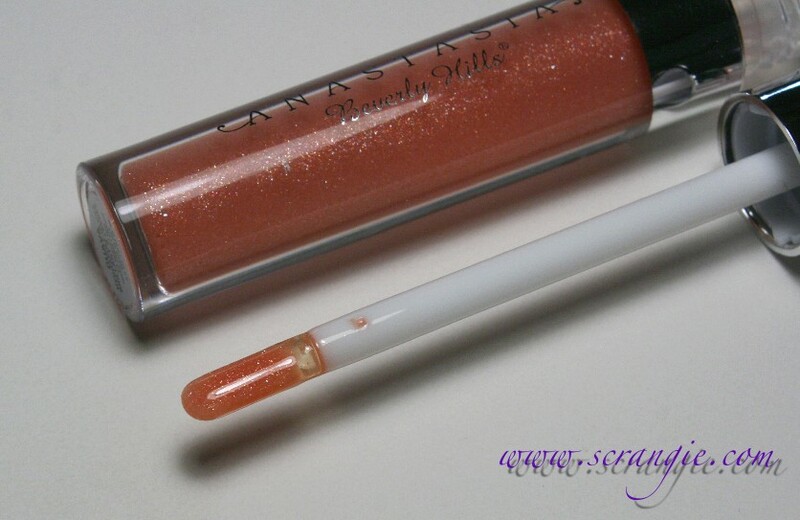 The gloss in this kit is a full-size Anastasia Hydrafull Gloss in Guava. It has a very odd paddle applicator. The Guava shade is interesting because it has tons of tiny rainbow-colored flecks. Click this to enlarge. Isn't that pretty? 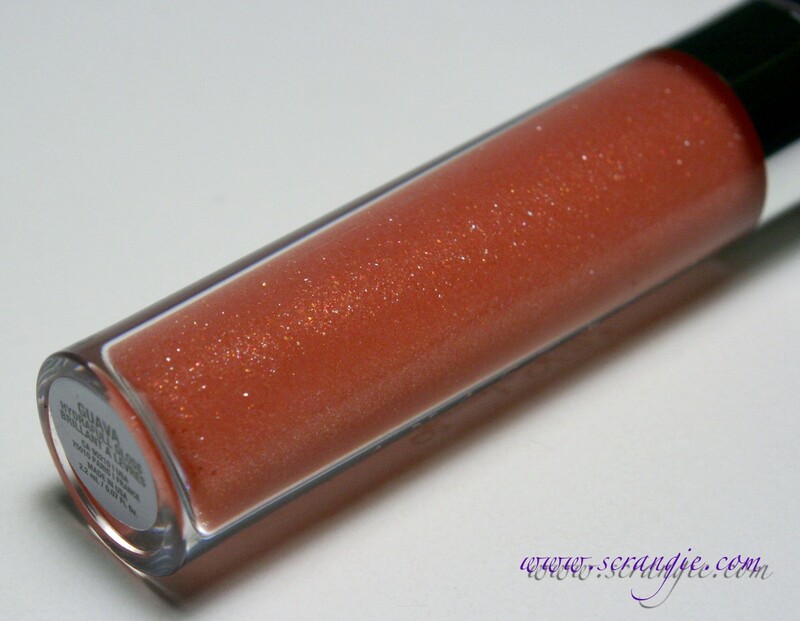 On the lips, Guava is just a sheer/clear shade with only a hint of a warm tint. No real color on my lips. The sparkles aren't in-your-face or glittery, but they look very pretty and twinkly when the light hits them just right. The Wish You Were Here set also includes a full-size Anastasia Clear Brow Gel. Since it's a clear gel, there's not really anything to swatch, but you can see how it looks on my brows here. 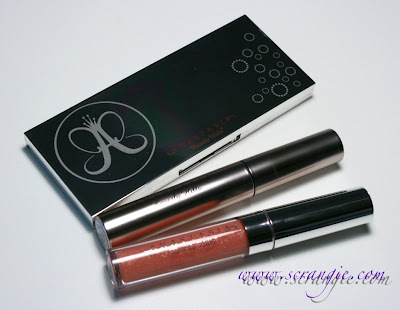 The set is an excellent deal; three full sized Anastasia products for $44. That's about half of what it would cost if you bought all three individually. The shadow colors are really pretty and they all go together. The shadows are smooth, easy to blend and fairly well pigmented. The shadows contain anti-aging skincare ingredients. The brow gel holds my brows in place all day without flaking. The brow gel is clear and you can only tell it's on your brows by the subtle sheen it leaves. The gloss has pretty rainbow sparkles! The gloss feels cushy and hydrating. The gloss smells nice. A very faint fruity vanilla. The brush that comes with the palette is kinda scratchy. The spatula applicator on the Hydrafull gloss is hard for me to use. The Guava shade doesn't feel as smooth and non-sticky as the other Hydrafull shades I've tried. 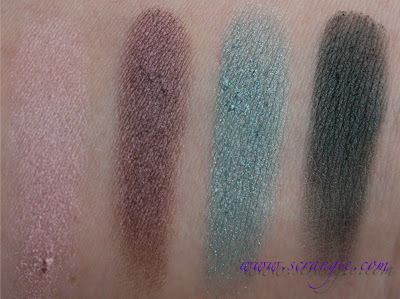 The prettiest shadow in the palette, the sparkly taupe, has the least pigment of all the shades. They can all be used wet for more payoff, though. Overall, I like the items in the set and I think it's a good value. The palette is pretty and versatile and I like Anastasia's Illumin8 shadow formula. The gloss is sheer but adds a nice subtle rainbow sparkle. Would probably be nice over lipstick, too. And I'm a huge fan of the Anastasia clear brow gel, so that's a nice item to have in here. That stuff has been the key item for taking my brows from okay-ish to nice and now I use it every single day without fail. Also, Anastasia is holding a contest where you can win a trip to LA for sending in your photo. Check out their Facebook contest page for more rules and details. It ends tomorrow (February 3rd 2012), so you only have a day left to enter! The Sephora-exclusive Anastasia Wish You Were Here set is limited edition and retails for $44. pink floyd is so depressing! I like some of their songs ($, lots from THe Wall) but gahhhhh....pretty much any song CAN be. Oh yeah, definitely! Probably why I like them so much. Haha! Pretty shadows. The gloss is nice also. I'm not going to buy any more shadows! Hah! I know what you mean, hahaha! 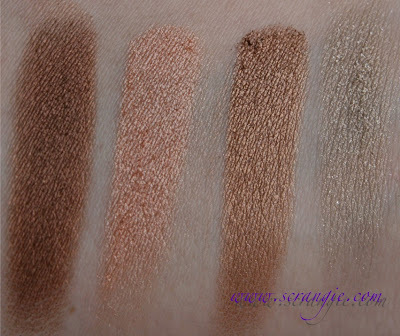 Love Anastasia eye shadows but they don't wear very long even with primer. The colors are very nice though. I have a bunch of their palettes and they seem to vary a bit in longevity for some reason. 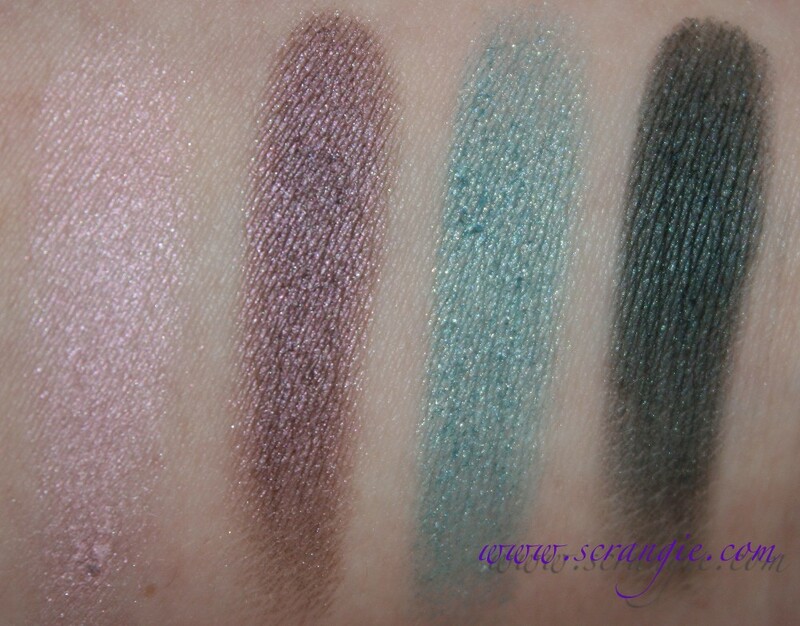 The two other full sized palettes I have are mostly awesome but I find that the lighter colors fade more than they should, just like you mentioned. But I have some of the duos and they don't wear well at all, the purple ones in particular seem to fade and change colors. The gold, brown, blue and darker types of colors from them are the best ones I've tried, but the lighter pinks and purples fade. They are pretty nice, just wish that taupe one had more kick to it! It's so pretty in person!